Of course you know Mike303 as the man behind Superfunk (biggest Hit: „Lucky Star“)… now you can hear his current more electronic sound on TOCA45! He teamed up with Fisher & Fiebak from Germany and they produced an impulsive techy bomb! Remixes by Alex Di Stefano, E-Boyz & Labelowner Tocadisco himself on top and the package is perfect! Tristan Garner: Alex Di Stefano for me !! Will try it for sure ! Dabruck & Klein: wow, amazing track! Phat!!! Baggi Begovic: 5/5 Alex Di Stefano’s remix is a real techy bomb! Popof: alex di stefano remix is my favorite! MC Flipside: Pumping…. nice tribute track…. solid builder. Blank & Jones: Full Support! Josh The Funky 1: 5/5 weird..i just got a record witht the exact same sample by Gnewkow & Norm on Caballero recordings. I like this one to though……..tocadisco mix is large! Rooster & Peralta: Funky fresh! Respectz to Mr Hardy a legend! Agent Greg: original is the one for me!! !very good!!! Peter Brown: full support !!!!!!!!!! Noel Sinner: tocadisco remix is cool! DJ Sender (DJ Magazine): 5/5 Very massive! Supporting the release! Love Tocadisco’s and Alex Di Stefano’s mixes, really really good! Jens Lissat: Alex di Stefano has the most energy!! Falko Richtberg: nice one! toca mix is my fav! The BeatThiefs: nice one toca! The Disco Boys: Wow, what a team! Big tune, full support! Eric Smax: it is ok, but not more … cool sample ! nice tocadisco remix ! Tom Wax (YOU FM Sounds): The Original is my fave! Dimitry ZooM: 5/5 Alex Di Stefano’s mix is a hot stuff! Andrea Belli (Radio105 Italy): Brilliant! 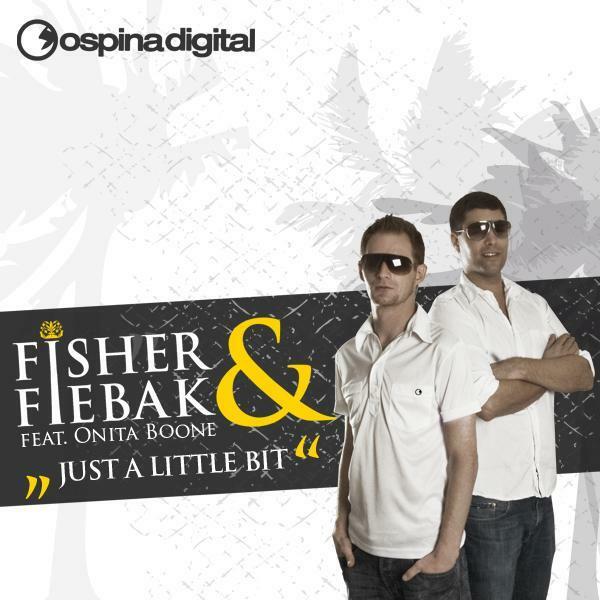 „Just a Little Bit“ by Fisher & Fiebak featuring Onita Boone is a collaboration of two experienced DJs and a gospel singer that has been created to bring some new freshness into the house music scene. Behind that project stand the two DJs Marc Fisher and Sebastian Fiebak together with the American gospel singer Onita Boone. Marc Fisher from Bielefeld/Germany alias Mister Twister has already become a solid institution within the electronic music scene. Already as a school student he could play the drums and the guitar. So the North Rhine-Westphalian DJ is not just popular behind the turntable. He has also explored music in its instrumental side. His first challenge as a DJ, Fisher took in the club Project in Bielefeld. Later he put on records in the club Glashaus in Bad Salzuflen/North Rhine-Westphalia/Germany. As a club owner Fisher could engage current DJs, such as Armand van Helden, Antoine Clamaron, DJ Pippi and Jamie Lewis. Fisher is also a well-known name beyond the German borders. He has already worked in hip clubs like the Studio Live in Istanbul and the Ukrainean Matrix Club and been involved in popular events, for example Rave on Snow in Saalbach/Austria and the Kazantip Festival in the Ukraine. Moreover, his grooves made him famous in the most inquired club of the Londonish house scene, the Ministry of Sound. So it is just a consequence that he came in touch with other big names of the scene. Collaborationswith artists like Eric Prydz, Steve Angello or Bad Boy Bill were the reward for his previous performances. The „House Connection Bootlegs“ is another project that is produced by Fisher. He also made remixes for Eric Prydz, Carl Roda and Norman Zube. Sebastian „Zwiebak“ Fiebak is diversity in just one person. Born in Leer/Lower Saxony/Germany, he now works as a DJ, Producer, Radio DJ and Event Manager as well as a Commercial Graphic Artist and a PR-Consultant. His career as a DJ started in 1994. First interested in house, Fiebak more and more received influences from electronic music. In consequence, he collaborated with Africa Slam, Bad Boy Bill, Dave Armstrong and Eric Prydz, just to name a few. Motivated by these experiences, the DJ was also booked abroad. After performances in Austria, Bulgaria, Turkey and the Netherlands, he established his name all over Europe. In 2006 the two DJs collaborated for the first time. Then the idea to create a common project, named M.A.S.E. (Marc & Sebastian), was born. According to the big popularity among music fans, additionally the project Fisher & Fiebak was founded. To give their project a unique voice, Fisher & Fiebak engaged the prestigious US-singer Onita Boone, who learned singing in a gospel choir. Already in the age of three, the powerful-voiced New Yorker made her first recordings. At the age of eight she wrote her first compositions, just to record them a bit later. The singer could raise her popularity by being engaged at the Broadway and performing in several musicals. But Boone was also active beyond New York. Productive cooperations with famous musicians, such as Patti LaBelle, Whitney Houston, Mariah Carey, George Michael and Bill Cosby made the afroamerican singer become a solid part of the show business. Beside those projects, Boone wrote songs for several companies. For example, she is responsible for the recogniton of BMW, Daimler Chrysler and the US Air Force. Also, the five-octave-strong singer has composed for artists like Mary J. Blige and En Vogue. The first single „Just a Little Bit“ by Fisher & Fiebak is a refreshing mix of house music and a powerful, emotional gospel voice. It has appeared on the well-known music label Ospina Digital, which has released remixes for Madonna, Britney Spears and Christina Aguilera.